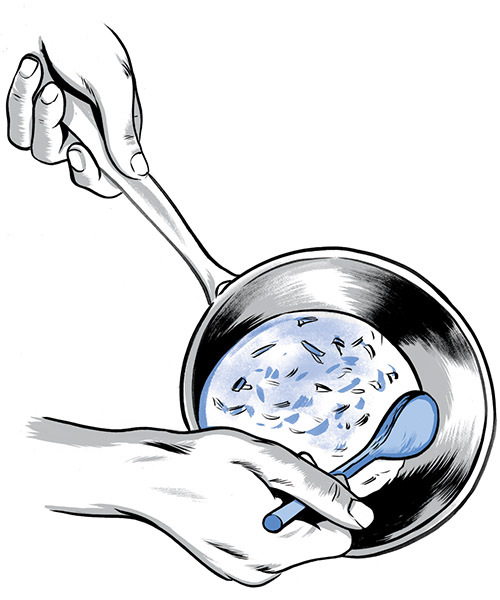 Making proper risotto comes down to the small things, starting with the type of rice you use. Unlike long-grain rice that cooks up light and fluffy, risotto rice contains a high proportion of sticky starch that turns creamy as it cooks. Arborio is the most commonly used variety, but Ullio prefers carnaroli, which holds its shape better because of its higher starch content. He keeps the burner at a medium-low heat from beginning to end and starts by toasting the kernels to release their starch. Unlike most recipes, which suggest raising the heat when you add the wine (a dry Italian white, preferably) and then dialing it down again, Ullio keeps the heat steady to avoid overcooking the kernels. Early in the process, Ullio stirs only occasionally to prevent sticking, but he picks up momentum toward the end when the mixture thickens and forms “lava-like waves” as it’s stirred. When done, the risotto should be saucy but not soupy, with kernels that are tender and translucent throughout but still firm. 1. Warm 6 cups of stock on the stove. In a saucepan, melt 1 Tbsp. butter over medium-low heat. Add ¼ cup chopped onion to butter and saute with a wooden spoon until translucent; do not brown. 2. Add 1 cup carnaroli to onions and saute for 2 minutes or until fragrant. Add ½ cup dry white wine and cook, stirring, until evaporated. 3. Add a ladleful of stock, stirring to prevent sticking. 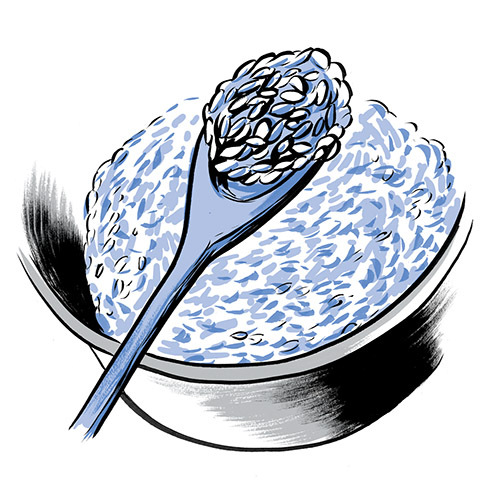 Once the rice has absorbed all of the liquid, add another ladleful and continue stirring. Repeat. 4. When mixture thickens and begins to form lava-like waves (all’onda), stir vigorously, sweeping your spoon in a circular motion around the edges of the pan and shaking the pan from side to side. 5. Risotto is done when kernels are translucent all the way through. Stir in another 1 Tbsp. of butter, and season with salt and pepper. 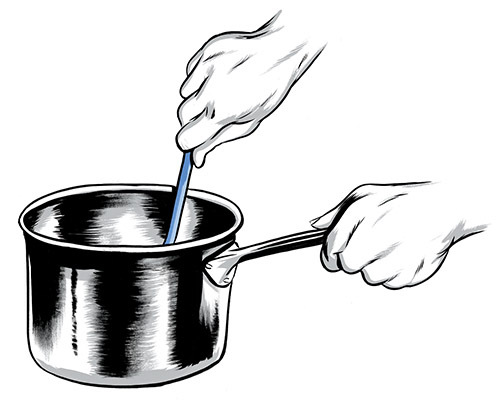 The ideal heavy-bottomed saucepan should fit the size of the burner to avoid hot or cold spots. The bottom shouldn’t be too wide, because the kernels need to rub against each other to create friction. Williams-Sonoma’s nonstick Hard-Anodized Copper Core Risotto Pan has a curved bottom and high sides that make for more efficient stirring. 1. Keep stock warm in a pot on the stove. Set a medium-size pan with a lid on another burner. Have seafood cleaned and ready to cook. 2. Set a heavy-bottomed saucepan on a burner the same size as the bottom of the pan. Add 1 tablespoon of the butter and melt over medium-low heat. Add onion and saute until translucent. Do not let brown. Add the rice and saute for 2 minutes, until fragrant. 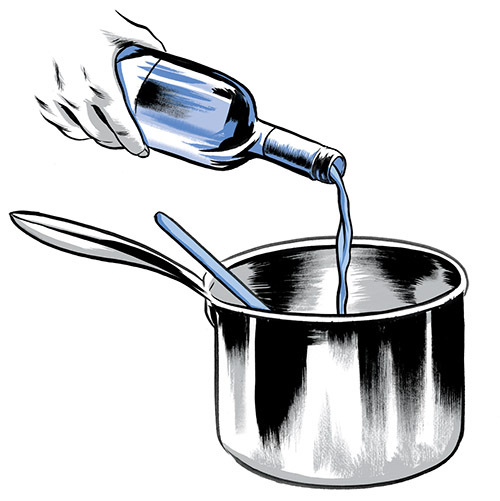 Add wine; cook and stir until evaporated. 4. Meanwhile, add a ladleful of stock to the medium-size pan; bring to a boil and add clams. Cover and let cook just until the clams are just opened. Remove to a dish. Repeat with mussels; remove and add to the dish. Cook remaining seafood, one at a time, in a little of the boiling liquid, until almost done. Remove to the dish. Add remaining juices to the stock. 5. 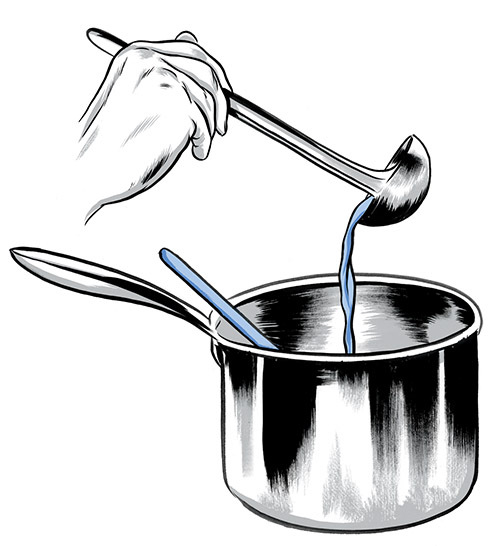 When rice mixture thickens and begins to form lava-like waves (all ‘onda), stir vigorously, sweeping your spoon in a circular motion around the edges of pan and shaking the pan from side to side. 6. Risotto is done when kernels are translucent all the way through. 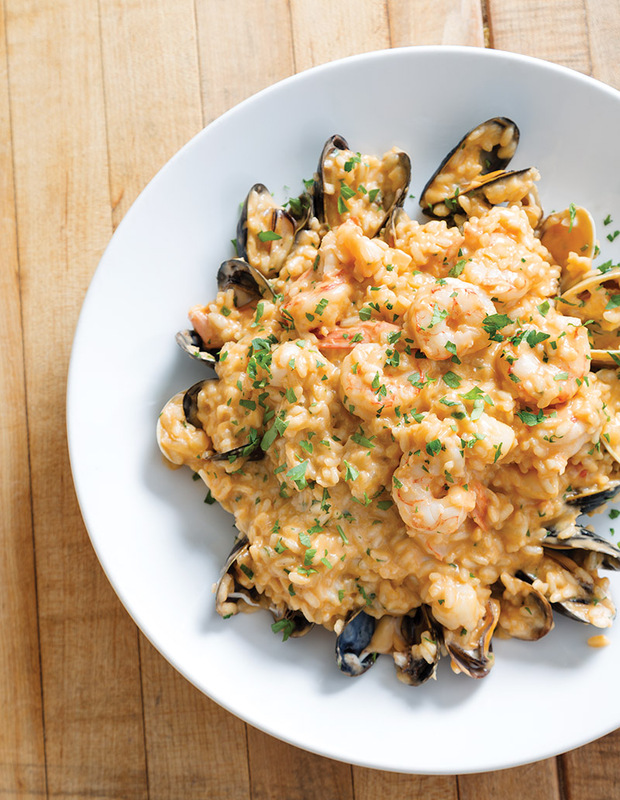 Stir in another tablespoon of butter and (for seafood risotto) 1/4 cup of heavy cream. Season to taste with salt. Fold in cooked seafood; garnish with parsley, if desired, and serve hot. 2. Add the shrimp shells, onions, carrots, celery, and garlic. Saute until tender and golden. 3. Add tomato paste; cook and stir a few more minutes, taking care that it does not burn. 4. Add water and simmer for 2 hours. 5. Strain, pressing all the solids to extract flavor. 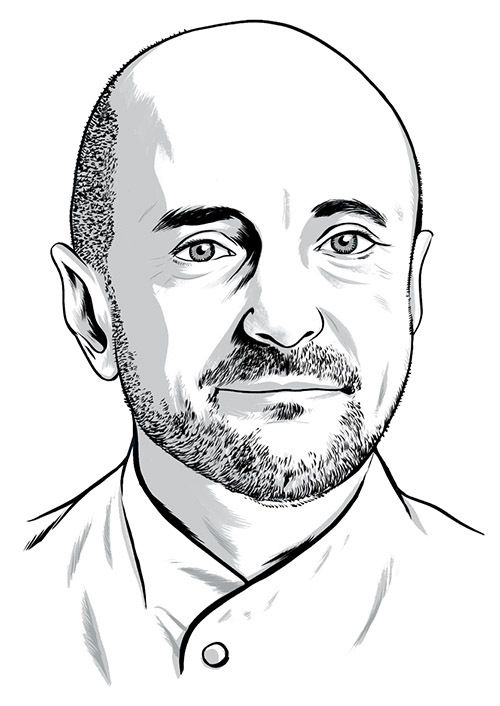 In 1999 Ullio opened Sotto Sotto in Inman Park, a paean to the simple, rustic cuisine of his Italian heritage rooted near his birth city of Milan. Stuffed ravioli and bowls of chocolate soup helped establish the cozy trattoria, but the star has always been Ullio’s risotto. Creamy, supple, and al dente, his risotto is a revelation in texture—yet a source of angst for any home cook who has tried their hand at a pot.